I am constantly amazed by the variety of "National Days" that exist. It's mind-blowing, and a constant reminder that it's a good thing to take a moment each day to celebrate something... Anything. Starting at the very top is the legendary Sandy Koufax in the midst of a hug with Clayton Kershaw after defeating the Braves during the 2013 NLDS. I'm fairly sure this was a photo taken by Dodger photographer Jon SooHoo. I was reminded of the pic, though, by DodgersBeat on twitter. The below card features former skipper Joe Torre embracing Manny Ramirez in a 2007 Topps Baseball card. I grabbed the pic from an ESPN story focused on "Great Hugs in Baseball History." 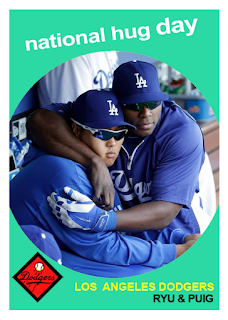 Hyun-Jin Ryu and Yasiel Puig hug it out on the bench in the 1959 Topps fantasy Baseball card on the below left. The photo was found thought a SportsNetLA tweet this morning. AJ Ellis and Clayton Kershaw did their hugging on the field in the 1979 Topps fantasy card on the bottom right. This photo was taken from a tweet by @MattDodgerBlue. Puig just loves to hug. So much so, I had to capture him hugging in a couple more cards. On the bottom left is banana aficionado, Kiké Hernandez, getting man-handled by Puig on the 1982 Topps fantasy card. This photo was from an Kiké tweet. The card on the bottom right is a little flashback. It featured Puig giving a bear-hug to former Dodgers shortstop Hanley Ramirez. This photo was from a post by Matt Monagan at MLB.com that ranks, "10 of the most huggable figures in baseball today."